This year’s Topps Football base cards were filled with excellent photography and design which has carried over to 2012 Topps Chrome Football. 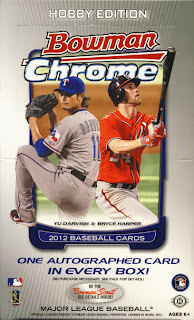 Collectors of the base set will appreciate the shiny version and various refractor parallels. 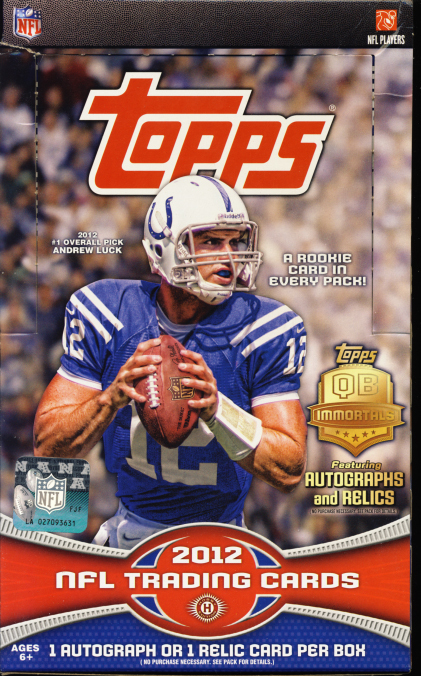 With great looking inserts, including 1957 style Rookie cards, 1965 Tall Boys and Red Zone Rookie Diecuts 2012 Topps Football a great purchase. 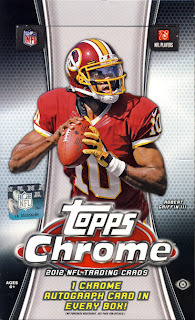 Topps Chrome Football falls under our trading card category. Each box contains 24 - 4 cards per packs with 1 rookie card per pack and the promise of 1 chrome rookie autographed card per box. Did The Trade Happy Rams Give It All Away In The 2012 NFL Draft? Draft day trades are always interesting. Teams try to improve their position, maneuvering their way higher in the draft so they can snag the next superstar. But in 2012, the St. Louis Rams seem to have been a little trade happy, giving away the number 2 pick overall and a lot more. With RG3 a candidate for rookie of the year, the question is did the Rams give away too much? Here are the details of all the trades the Rams conducted involving the 2012 draft starting with the biggest trade. 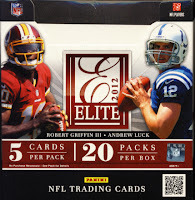 The All About Cards 2012 Panini NFL Player of The Day Main Prize Pool Winners List. We have randomized the list of entries and here are the results. 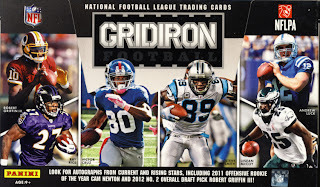 At Noon PST today we will be announcing the winners in our 2012 Panini America NFL Player of the Day Main Prize Pool. There are 12 prizes left in our pool that will be awarded today. 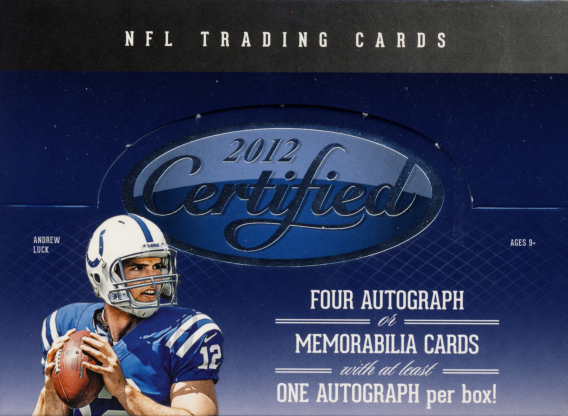 We have come to the end of our 2012 Panini America NFL Player of the Day promotion. Thank you for making it a big success. 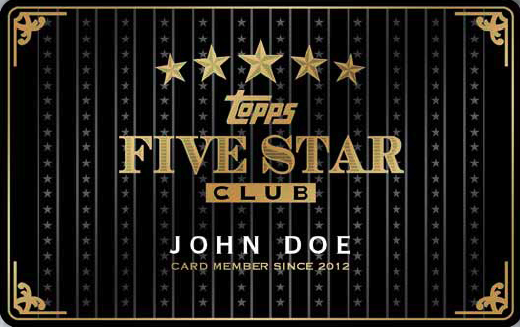 In addition to the great prizes that a lot of you will be receiving, I hope you had a good time participating in the promotion, both here and at your local card shop. 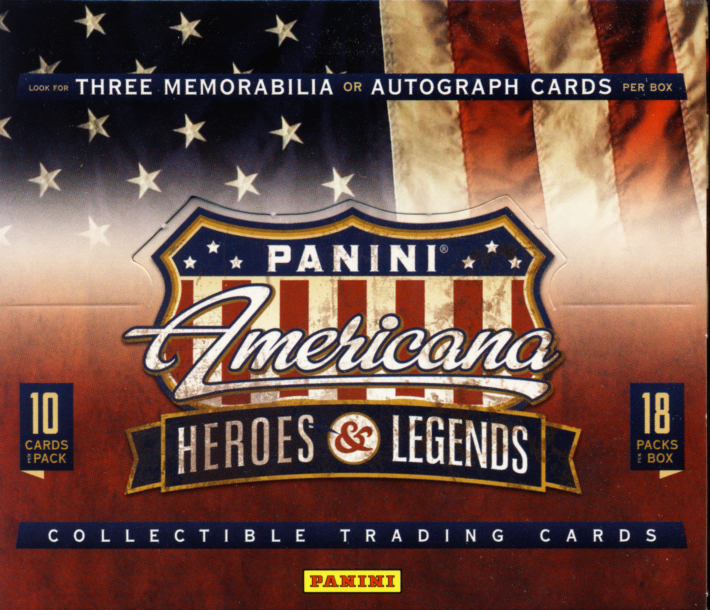 A huge thank you also goes out to the good folks at Panini America for providing the prizes. If you haven't already, make sure you are following them at @PaniniPOD and @PaniniAmerica on Twitter and that their blog, The Knight's Lance, is part of your reading list. If you like the way we have run the Player of the Day promotion here on All About Cards and you would like to see it return next year, please tweet, email or contact them to let them know. Speaking of prizes, here is a sneak peek of the early prize packages that have already been awarded in our weekly challenge questions and mini contests throughout this promotion. 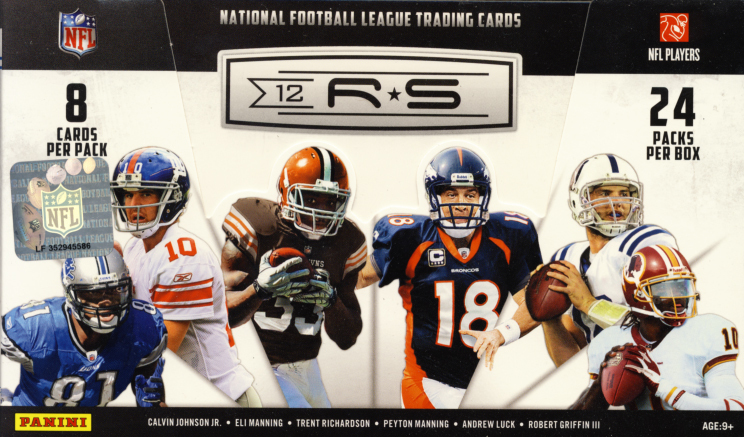 This is week 13 of the NFL season and it is also the 13th week of working towards the completion of our 2012 Panini NFL Sticker Collection. This week we have our first completed page. Normally we pick players to watch for the week, but this week we are featuring an important program, Pop Warner Football. Pop Warner Football is a non-profit organization that provides youth football for participants in 43 U.S. states and several countries around the world. Pop Warner is the largest and oldest national youth football organization in the United States. It is also the only youth sports organization with an academic requirement. Pop Warner's commitment to academics is what separates the program from other youth sports around the world. 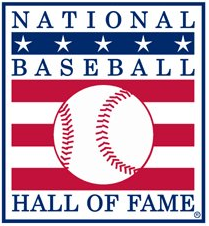 Today the Baseball Writers’ Association of America released the 2013 Hall of Fame ballot. There are 37 former players on the ballot that can be chosen by the 600-plus eligible voters. The ballot consists of 13 returning candidates, but notable are the 24 newcomers. This is a big year for first timers as players like Sandy Alomar Jr., Craig Biggio, Jeff Conine, Julio Franco, Shawn Green, Ryan Klesko, Kenny Lofton, Mike Piazza, Reggie Sanders, Curt Schilling, Mike Stanton and David Wells have made the ballot. But the bigger issue will be addressing whether the careers and achievements of players who were accused or suspected of using performance enhancers are worthy of making the Hall as players like Barry Bonds, Roger Clemens and Sammy Sosa have entered their first year of eligibility. So far the biggest name that the writers have had to deal with that has ties to performance enhancers has been Mark McGwire, now in his 7th year on the ballot. Last year he received 19.5% of the vote. Candidates who receive less than five percent of the vote in any Hall of Fame election are dropped from future consideration. Others returning to the BBWAA Hall of Fame ballot include (with their 2012 vote percentage in parentheses): Jack Norris (66.7%), Jeff Bagwell (56.0%), Lee Smith (50.6%), Tim Raines (48.7%), Alan Trammell (36.8%), Edgar Martinez (36.5%), Fred McGriff (23.9%), Larry Walker (22.9%), Don Mattingly (17.8%), Dale Murphy (14.5%), Rafael Palmeiro (12.6%) and Bernie Williams (9.6%). Voting ends and all ballots must be returned by December 31st. The results of the election will be announced Jan. 9 live on MLB Network and at the Baseball Hall of Fame's website, and any candidate named on at least 75 percent of ballots submitted will be enshrined at the National Baseball Hall of Fame and Museum in Cooperstown on July 28. Here is the complete list of candidates on the 2013 BBWAA Hall of Fame ballot. I hope everyone had a fantastic Thanksgiving and survived Black Friday. 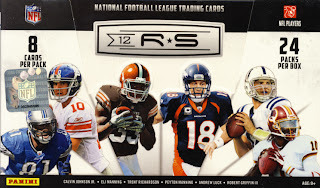 While waiting for Cyber Monday what is a sports card collector to do with their time? If you can’t get your fill of doorbusters and blowout deals, here is one to hold you over until Monday. 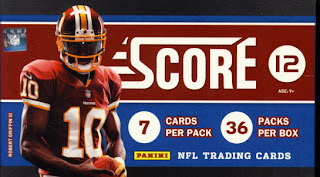 This will be the last opportunity for you to collect entries to win the great prizes in our 2012 Panini NFL Player Of The Day Main Prize Pool. There are ten questions listed below and for each one you answer correctly you will receive an entry. If you answer all 10 correctly, you will receive an additional 5 entires. So a total of 15 entries are up for grabs per person. 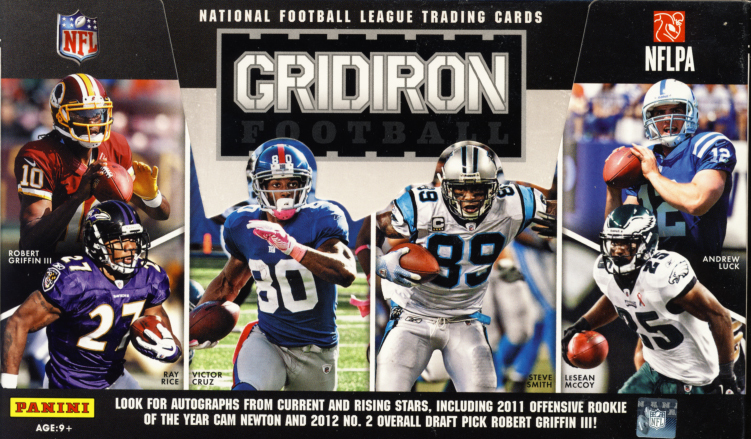 For those of you who have been following our Panini NFL Player Of The Day promotion the whole time, many of these answers will be easy, but even if this is your first time here, you should be able to answer all of these questions by looking at our previous posts. All of your answers must be emailed to AACNFLPOD (at) Yahoo (dot) com by Sunday, November 25, 2012 at 11:59 PM PST. Do not leave you answers here or on our Facebook page, all answer MUST be emailed to qualify. Make sure you are following us here on the blog, or on our Twitter account or like us on our Facebook page. 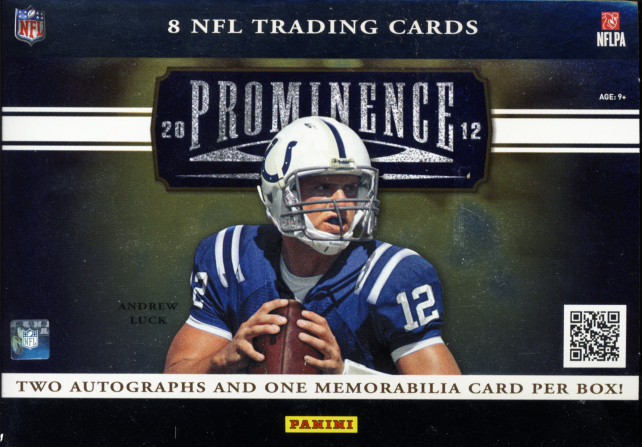 This was the last opportunity to win prizes in our weekly challenge questions contest, but keep on the look out for more ways to enter our Main Prize Pool in our 2012 Panini America NFL Player Of The Day Promotion. We only had one winner this week with an Ordine was Dakota Webb on Twitter. For the Ordine, Dakota Webb will have his choice of a pack of NFLPOD cards or a randomly selected individual Silver Foil NFL Player of the Day card that includes players like Cam Newton, Andrew Luck, Peyton Manning, RG3, Tim Tebow, Trent Richardson and others. 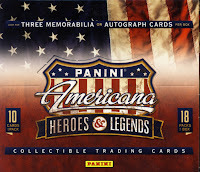 This will be the last week to win prizes in our 2012 Panini America Player of the Day promotion by answering challenge questions. There will still be opportunities beyond this including one big blowout quiz that will give you a chance to pick up some bonus entries if you have been paying attention to this blog. More details on that later. 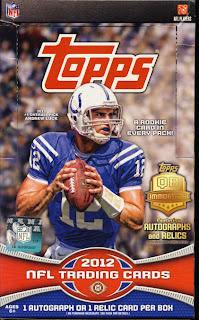 For this week’s Panini NFL Stickers Players to Watch we will be looking at some veteran Quarterbacks. You can instantly win prizes this week depending on how many of our Weekly Challenge Questions you get correct. I will be using standard fantasy stats from NFL.com to determine the winners. If I had to base my review of 2012 Panini Certified Football solely on the box I opened alone, I could distill my review down to one word – “ouch!” Keep in mind, I did pull a John Elway game worn material swatch card #/199, but the other hits were Rookie swatch cards and one auto of a wait and see non-premiere rookie. But I never base my review just on the box I open. This prevents me from giving a case hit box an automatic good review and the box that misses an automatic bad review. I check case breaks, checklists and as much information as I can to determine what most box breaks should look like for the product I’m reviewing in addition to the best and worst case scenarios. While 2012 Panimi Certified Football on the whole is much better than the box I broke, the redesign of the base cards from mostly mirror finish to edge to edge mirror finish and the $2 per card average price set that is base heavy with only 1 autograph per box leads me to question who these cards geared towards. 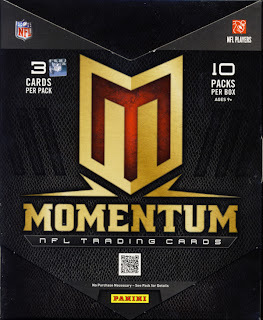 As we start to wrap up our 2012 Panini America NFL Player Of The Day Promotion, there is just a short amount of time before we hand out our grand prizes from our Main Prize Pool. This week was a test to see who were the folks who were most closely watching our promotion. I delayed posting the contest, leaving just a few hours to enter. Honestly, I was pleasantly surprised by the amount of entries. As a bonus who got their guesses in, I increased the number of bonus entries for our Main Prize Pool. More on that later. We only had two winners this week, but one of them was our second Perfetto winner. 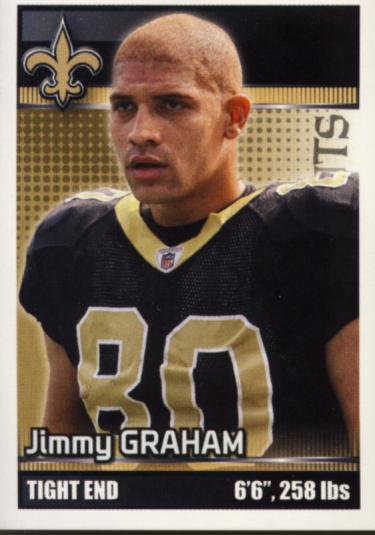 For this week’s Panini NFL Stickers Players to Watch we will be looking at some veteran Running Backs. 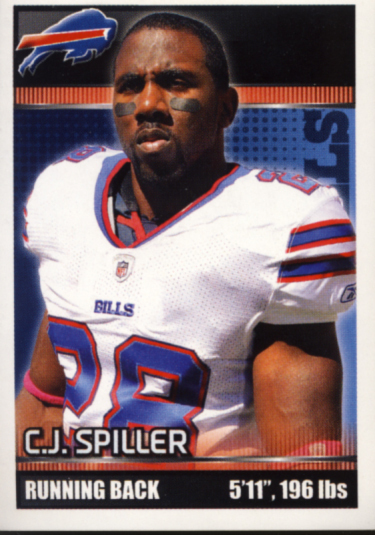 You can instantly win prizes this week in our 2012 Panini America Player of the Day promotion depending on how many of our Weekly Challenge Questions you get correct. But you need to act quick because your answers have to be in before this week's first Sunday games begin. I will be using standard fantasy stats from NFL.com to determine the winners. We had some winners who got last week’s Challenge Questions correct. 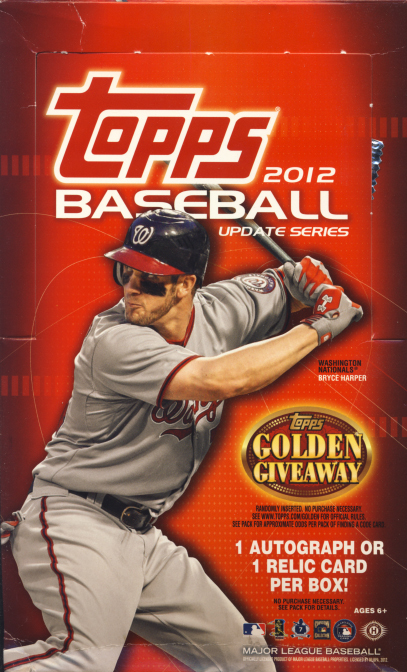 We are coming back this week with even more chances to win prizes in our 2012 Panini America Player of the Day promotion. 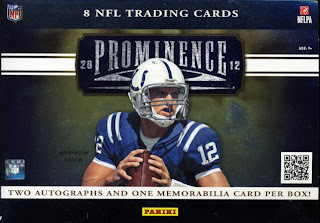 For this week’s Panini NFL Stickers and Players to Watch we will be looking at some of the top Quarterbacks in the NFL. You can instantly win prizes this week depending on how many of our Weekly Challenge Questions you get correct. I will be using standard fantasy stats from NFL.com to determine the winners. 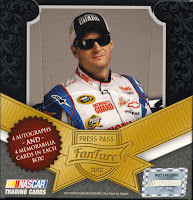 Press Pass FanFare returns, now in its second year and is still an excellent NASCAR release. This is still a base set/big hit premium product with lots of bang for the buck. 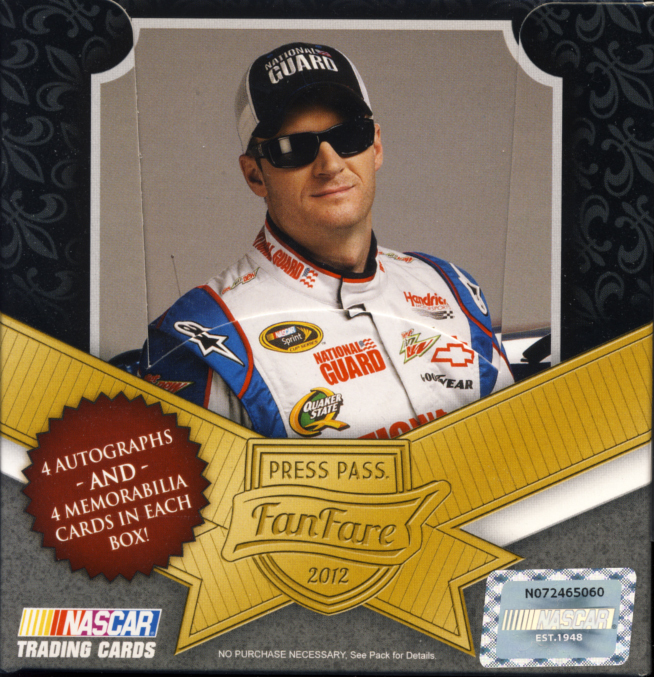 We classify 2012 Press Pass FanFare as premium cards. 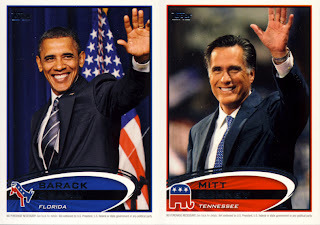 Each hobby box contains 8 – 5 card packs. 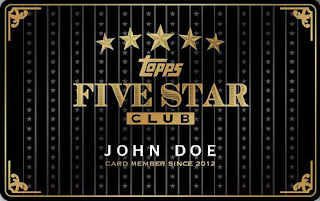 Each pack contains either one Autograph card or Magnificent Materials race-used memorabilia card., for a box total of 4 Autographs and 4 Memorabilia cards.